If you use a to-do list you know how it tends to multiply itself. It never seems to be finished and always gets longer. It’s time to change that. It’s time to make shorter to-do lists. Crossing things off as done gives most people a sense of accomplishment. Which is a good thing. We want to feel accomplished and it’s not the crossing things off that is the culprit. It’s the false sense of being productive by crossing something off. Our society has made being productive synonymous with being busy. Working long hours and always doing something is viewed as if you’re productive and getting stuff done. However, being busy doesn’t necessarily mean you’re being productive. Quite often, it’s the opposite. You’re busy but not productive. That leads to the feeling of never having enough time doing the things you want to do. To-do lists have become a dumping ground for anything and everything, which is fine. Getting things on paper instead of trying to keep it in your head is a good thing but what seldom happens is any thought of why things are on your to-do list. Start asking yourself why a task is on your to-do list and what purpose it serves. Is it an essential task that will make a difference in your life or is it what I call a stocking stuffer? A stocking stuffer is a task that keeps you busy but that is not essential and only keeps you distracted from working on tasks that would move you forward both personally and professionally. 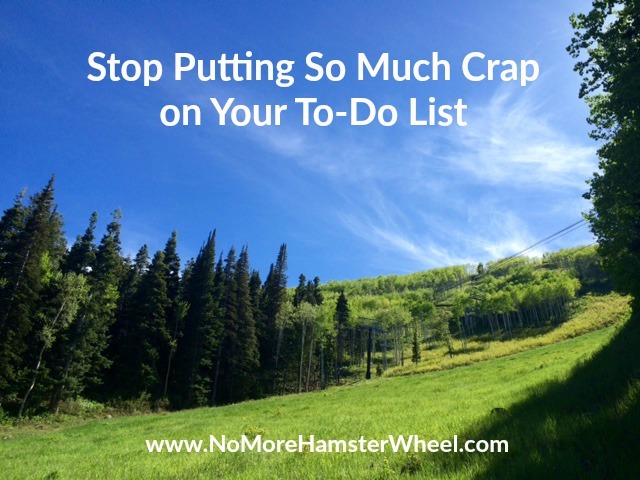 I teach my clients to do what I call a brain dump meaning instead of using their to-do list as their dumping ground they actually create a specific place for it, dump everything there and then use that as a base to create either a daily or a weekly to-do list that’s super short and focused. Each item on the to-do list has a purpose, is lined up in order of priority and is scheduled to be done that day or that week. A huge reason why people don’t get everything done they set out to do, even if they have a short and focused to-do list, is because it’s not on their calendar. We are masters at underestimating how long a task will take us. Which means, that if we only look at the list of to-do’s it’s easy to think we can easily get it done that day, but it’s first when we block out time on our calendar we get a correct picture of what can be accomplished. I’m challenging you right now to take you to-do list and try to fit it in on your calendar. Between life, meetings, errands and everything else that needs to be taken care of, my guess is that your to-do list is a bit overambitious. That’s why putting your to-do’s on your calendar is so effective. It gives you a visual view of your day and what you realistically can accomplish, which forces you to prioritize better. – How important is that task if it means you won’t have time to go exercise? – How important is that task if it means crossing it off will make you skip lunch when you promised yourself you’re going to take a daily lunch break? – How important is that task if it means it will only make you more tired and unfocused because you’re already exhausted? – How important is that task if it means staying up late and not getting your sleep in? – How important is that task if it means saying no to quality time with friends and family? Feeling accomplished by crossing things off is great but if it comes at the cost of missing out on life then how is that an accomplishment? It takes a shift in mindset to start working in a productive, yet not busy way so that you can create time to enjoy life. It means going against what society has engrained in us. It means that others may think you’re lazy for not running around like a chicken with your head so exhausted you don’t know what’s up or down. It means that anytime you utter the words “I’m so busy!” you mentally give yourself the grade F. Being busy isn’t a badge of honor. It means you’re not working on the essentials but working on stocking stuffers. It’s time to change your thinking. It’s time to work on the truly important things so that you can work less. It’s time to be productive but not busy. It’s time to rip up that long to-do list! Today is a perfect day for me to read this! I do a weekly review on Sunday and tend to put too much on my to do list for the week and if I schedule it, still do not leave myself enough open space in my schedule. I also often stay up too late on Sundays getting trying to finish those to dos for the week. I feel the stress right now of a nebulous to do list somewhere. Time to cut that list to what is really essential but also just do those things that have been on my list to long.